Since the last few days, I have been reminiscing on the blog about the year gone by. Today, for the special occasion of Christmas, I am taking the reminiscing a bit further, going back to the wonderful X mas we spent last year, at Shimla! This was the Gingerbread house at the Club Mahindra's resort - Whispering Pines, at Mashobra, near Shimla, which is where we stayed. Standing next to the Christmas tree, loaded with presents, it was surely the first thing anyone stepping into the resort headed to! Samhith particularly enjoyed the Christmas party, with all the goodies we had, to eat. 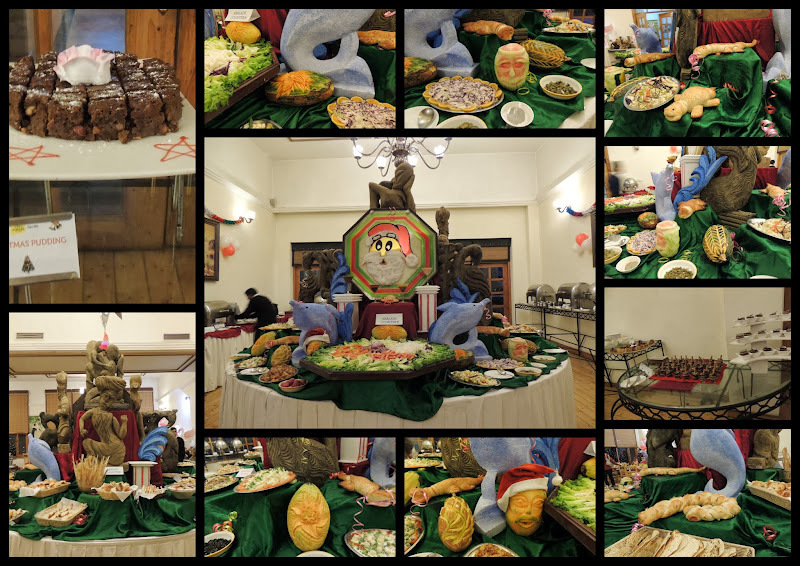 Here is a glimpse of the spread... which, just remembering it, makes my mouth water! This year, to say we have missed all that, would be an understatement. However, staying home has had its perks, chiefly among which is Samhith's experience, of singing Christmas Carols with all his friends, at a Remand Home, nearby... and we look forward to playing Santa on Wheels with the Breakfree gang! Thus, it seems apt to say that if it was Xmas for pleasure last year, it is Christmas with a Purpose, this year!! On that note, let me wish you all, a very, very Merry Christmas!!! Wow, you had a wonderful Christmas last year..
That's a heart warming recap! Enjoy every moment. Merry Christmas and Happy New Year!